So I was in Sacramento over the weekend for the Sacramento Lindy Exchange. Though you won’t hear me admit it very often, I really do like lindy hopping in Utah, really. It’s just that the scene is pretty small and I get burned out quite often. I used to go out swing dancing 3-4 times a week, if I could. Now I just go twice a week, once for a team practice and once for fun. Why do I bring this up in a post about the Sacramento lindy exchange? Because dancing with all of the really good dancers in Sacramento (I’ll give credit to the OC lindy exchange as well a few weeks ago, which I forgot to post about), as cheesy as it may sound, got me excited about dancing again. I’m not sure how it goes for other forms of dance, but as far as lindy hop is concerned, if you don’t travel, you’re only gonna get so good. Traveling to other places to dance, meeting lots of new people, dancing with people you may or may not see again, watching lots of really good dancers, and the excitement of being on vacation all contribute to a better learning environment. Of course, the hard part is maintaining that excitement and new level of dancing when you return to your normal dances with all of your normal friends. Don’t take me wrong. I’m really not complaining about “normal dances” and “normal friends.” While I learn a lot and am inspired through my travels, I really get to put things into practice at the “normal dances” with my “normal friends.” If it weren’t for the “normal friends” you practice with, who you critique and who critique you, you’d be pretty limited. 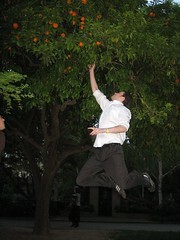 Of course, there are other aspects that come into how fast you can learn such as if you take group lessons, private lessons, watch videos, etc., but my point today is that traveling is fun, but don’t eat the oranges off the trees at the State Capitol building in Sacramento in late March. They were really, really gross. I can’t wait to practice and solidify all the crazy ideas I got over the weekend.